ANCHORAGE, Alaska — Sam Larson was looking for loopholes. 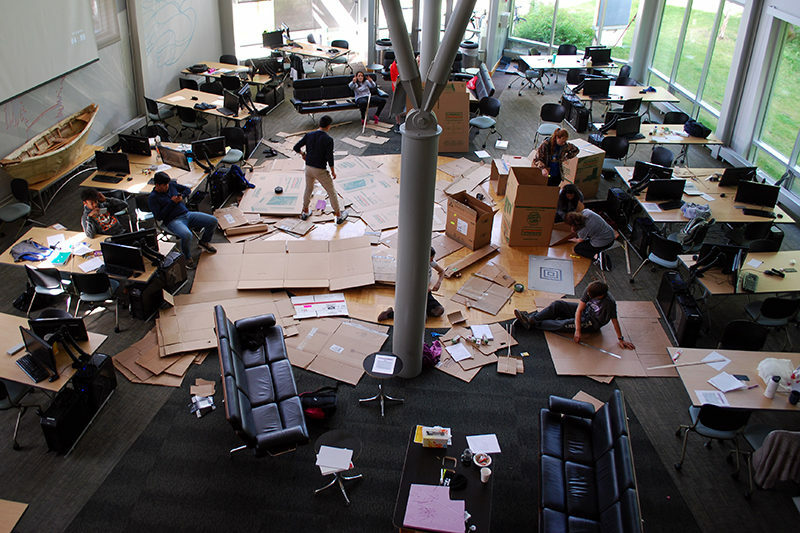 Crouched on the floor of a sunny student building at the University of Alaska, Anchorage, Sam was surrounded by cardboard, scissors, rulers and about a dozen other high school students. 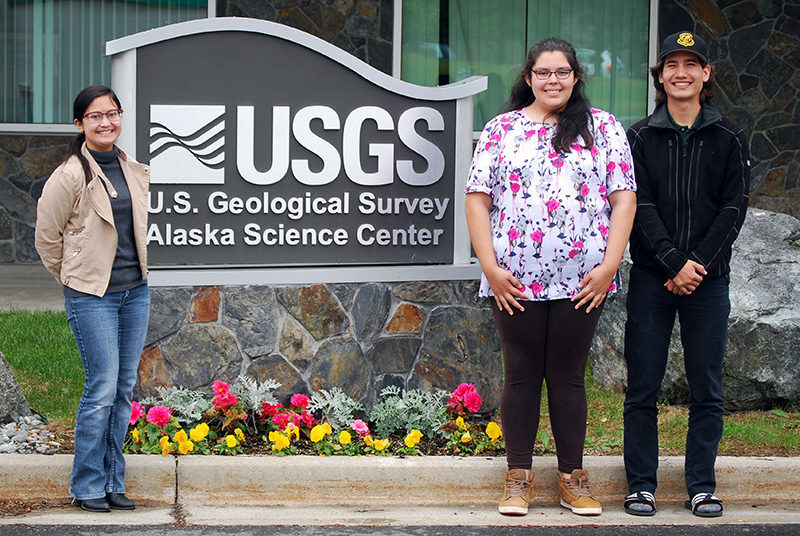 All of them were attending a residential summer “Acceleration Academy” hosted at the university by the Alaska Native Science and Engineering Program, or ANSEP. 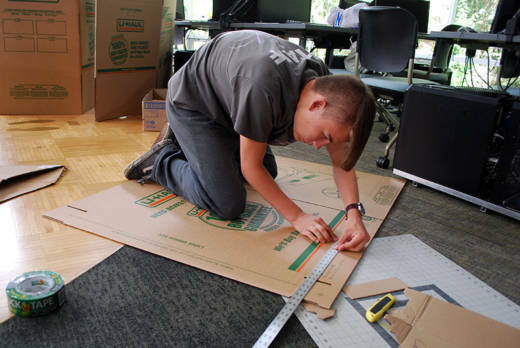 On this July day, with pop music playing in the background, Sam and his classmates were trying to build cardboard canoes capable of transporting at least one paddling student to a target and back. Back in his hometown of Homer, a cruise-stop town on the southern coast of Alaska, Sam’s father runs an internet provider service and his grandfather owns a mechanic’s shop. But moments like this one, where he has the opportunity to use math and science to solve a complex problem with his own unique solution, have led Sam to want a different life, a life most of his ancestors couldn’t have pursued. He plans to be an engineer. Like 80 percent of the students enrolled in ANSEP, Sam is Alaska Native. Children with his ethnic background are much more likely than their white peers to grow up in poverty, fail standardized assessments of math proficiency and skip college. The ANSEP kids are proof that such statistics are only true until they are not. Ayiana Browning, 15, Sam’s canoe-building partner, worked on paddles and explained all the things she loved about Acceleration Academy. In addition to the college-level math classes and the STEM labs like this one, the students had been paintballing, hiking and out for fro-yo (twice). In an odd twist, that family owes its start to one white guy’s search for an engineer with Native roots. Herb Schroeder, who became a professor of engineering at the University of Alaska in 1991, spent his early career researching rural sanitation. A few years later, research complete, Schroeder reflected that relationships between the sanitation engineers and the people living in Alaska Native villages had been fraught. In part, he thought, this was because most public health service engineers were non-Native. Schroeder decided his next goal should be to “make” some Alaska Native engineers. There were only a few Alaska Native students majoring in any engineering discipline enrolled at the time and Schroeder could not find a single Alaska Native person in the state or country who held an engineering Ph.D. Horrified, Schroeder decided to start a scholarship for Alaska Native engineering majors. Once he’d secured an initial corporate gift of $100,000, Schroeder said university officials told him they weren’t interested. “We’re not going to dumb down our school and have a bunch of Natives here,” he remembers being told. Refusing to subscribe to an idea he found ludicrous — that Alaska Native people as a group weren’t smart enough to succeed in science or engineering — Schroeder plowed ahead with his plans, offering a single scholarship in 1995, the year in which ANSEP officially began. Initially, he offered the scholarship along with help enrolling in remedial math classes the summer before students’ freshman year in college. When Schroeder finally concluded in 2009 that there weren’t enough university freshmen of Alaska Native descent prepared to succeed in college-level science and engineering courses, he (and the staff who had joined him by then) started a high school program. When they quickly discovered there weren’t enough high school students who’d completed algebra by ninth grade, a critical step on the road to a successful STEM degree, the group started a middle school program. ANSEP now serves 2,500 students, from middle school through graduate school. As a group, the students, who refer to Schroeder as Herb and to their program by its acronym, outperform most of the rest of the country on measures of math and science. By the end of middle school, 77 percent have completed algebra, a feat only 26 percent of the nation’s eighth-graders achieve. By college graduation, all participating students have held at least one internship in either scientific research or engineering. Two of the program’s graduates are now the first Alaska Natives in the world, Schroeder thinks, to hold doctorate’s in their fields. Another ANSEP grad has begun doctoral work in Colorado and a fourth has been accepted to a doctoral program at the University of California, Berkeley. Given the poverty, prejudice and generational trauma faced by many children of Alaska Native descent, a program that serves them this well is a role model. At a conference in January, ANSEP leaders offered representatives from universities and departments of education in nine states a look at what has fueled their success in the hopes that it will be replicated. The achievements of ANSEP were “inspiring and at the same time intimidating,” Chris Botanga, an associate professor of genetics at the predominantly black Chicago State University, wrote in an email. Nevertheless, Botanga has begun looking for money to fund a similar endeavor in Illinois. Conference attendee Overtoun Jenda, a professor of mathematics at Auburn University in Alabama, and his team have already put on an inaugural engineering summer camp for 30 sixth- though ninth-grade students living in Alabama’s rural Black Belt. Teams in South Carolina, Montana and Texas have also begun work on pilot projects and on pulling together funds to better serve rural students, American Indian students and female Hispanic students, respectively. “The thing that stuck with me the most is just how much of a community the ANSEP program has built,” Cole Garman, a conference attendee and college intern at the North Dakota Department of Public Instruction, wrote in an email. “They weren’t just there to get their education and get out, the students who participate in ANSEP really care” about their fellow students’ success. That’s by design. Students are required to help each other with studying, homework and STEM labs. Like the program’s other primary tenets — high expectations, mentorship and frequent opportunities for success — the power of teamwork is not a radical idea in the world of education. And yet, all four are deployed with stunning success at ANSEP. The majority (70 percent) of ANSEP’s $7.6 million budget in 2017 came through state and federal sources, including a few individual Alaskan school districts, the University of Alaska, the National Park Service, the U.S. Fish and Wildlife Service and the National Oceanic and Atmospheric Administration, among others. Philanthropic and private funders provided the remaining 30 percent of the budget, according to a fiscal report provided by the program’s leaders. ANSEP is always looking for additional support and new funding models. The latest innovation is a partnership model that allows the program to run year-round Acceleration Academies in two Alaska school districts. Last summer, ANSEP fell $1 million short on their Acceleration Academy budget and 150 eligible students were unable to attend. For 2019, ANSEP leaders are trying to raise $3 to $4 million more because they will have 300 to 400 more qualified students graduating from their Middle School Academy. Simultaneously, they are working to boost Middle School Academy attendance to 500 a year. Jill Jacobs, 16, said it was the Middle School Academy’s make-your-own computer day that changed her life. Jill had signed up for the academy on a whim, only to find herself seated at a table with a few fellow students and some computer innards she’d never seen before. Like every ANSEP student before them, Jill and her classmates were told that if they could use those parts, and the others that they’d be handed, to build a personal computer, they could take it home. If they could pass Algebra I by the end of eighth grade, the promise continued, they could keep the computer for good. With help from her team and an instructor, Jill built her computer, went home and signed up for Algebra I. “Just the fact that students recognize the negative stereotype is evidence that it’s a challenge,” said Michael Bourdukofsky, a civil engineer and the chief operating officer of ANSEP. The phenomenon of students performing less well on any number of tasks when reminded of negative stereotypes associated with their identity is so well documented by social scientists that it has a name: stereotype threat. Alaska Native students are particularly at risk of stereotype threat when it comes to their confidence in math and science. A 2015 evaluation of ANSEP by the Urban Institute, a think tank focused on economic and social policy research, reports that “though Alaska Natives make up 15 percent of Alaska’s population and 10 percent of the workforce, they are only 6 percent of the state’s workers in computer, engineering, and science occupations.” The evaluation also found that Alaska Native students, who make up 23 percent of the student population in Alaska, accounted for just 12 percent of students enrolled in middle school algebra in 2010-12, and just 5 percent of students enrolled in high school calculus. Getting ANSEP students, especially those from tiny rural villages, to college takes more than an early introduction to differential equations, Bourdukofsky said. They also have to learn the fine art of meeting new people and, eventually, networking. Bourdukofsky should know. A member of the Unangax culture, he grew up on St. Paul Island, located in the Bering Sea between the U.S. and Russia and home to just 500 souls. After attending high school in Anchorage, he arrived at the University of Alaska as a freshman in 1998, just a few years after ANSEP launched. “They already had the weekly meetings, which were a time to connect with each other and with professional engineers,” Bourdukofsky said. All of his internships came from those meetings, he said. Another important element of those gatherings? Food. Augustine Hamner, 19, said she loves the ANSEP food. Sitting two miles away from the UAA campus in the well-appointed cafeteria of BP, the major gas and oil company where she spent the summer as an engineering intern, Hamner said the Friday pizza is one of her favorite things about being part of ANSEP’s University Success program. She also is pleased that “older friends” are always available at ANSEP’s dedicated campus building to lend an ear or a hand. 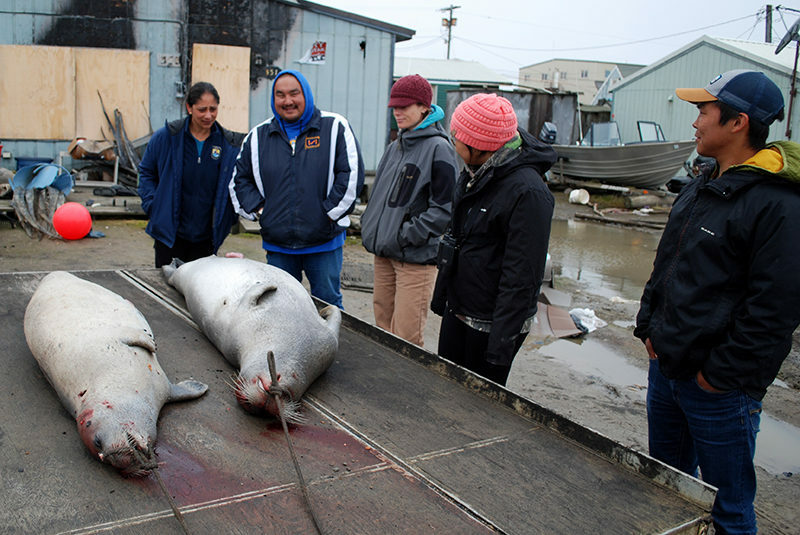 Last July, Hamner, a member of the Yup’ik and Iñupiaq cultures who lives in Anchorage, was on her second internship. Across town at the low-slung Department of U.S. Fish and Wildlife building, Caitlyn Twito, 18, was starting her first. 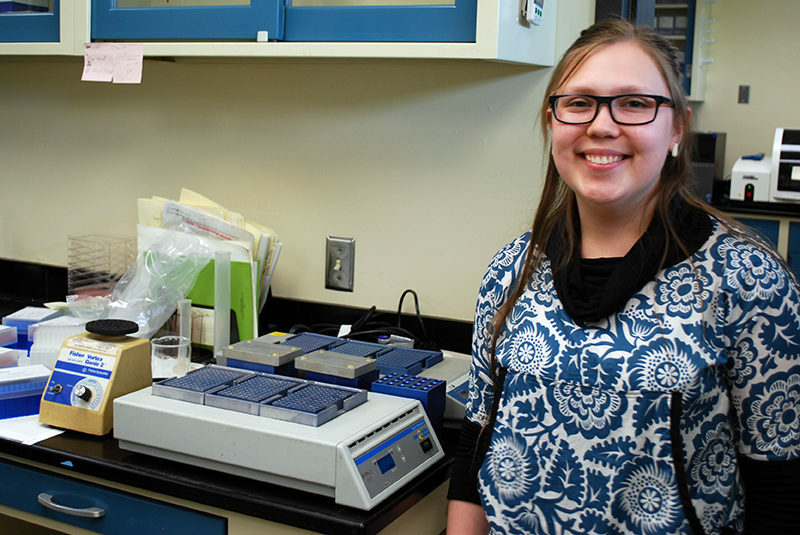 A participant in ANSEP’s Summer Bridge internship program for rising college freshmen, Twito had been spending her summer extracting DNA from fish, instead of hauling them out of the Kuskokwim River in the Yukon Delta, as she usually does. 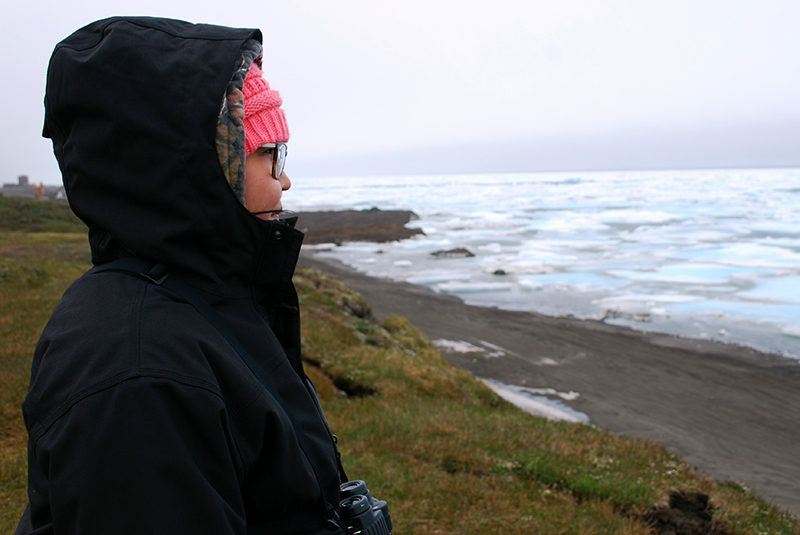 Twito, who identifies as both Yup’ik and white, is studying biology in the name of helping her family and friends. Her younger brother had to spend the first summer of his life in a Neonatal Intensive Care Unit. The closest NICU to home was nearly 400 miles away in Anchorage, with no road between the two towns. It was a hard time for her family and it inspired her to become a nurse and work in her hometown. It will be nice, she said, to care for people she knows. Though many students mentioned a desire to return home after college graduation, ANSEP does not explicitly encourage any one future path. Back at the ANSEP building on UAA’s campus, Charitie Ropati, 17, and two classmates worked on the readings for a summer course on Native culture. Like the advanced math classes, the Alaska Native Studies class counts towards college credit for Acceleration Academy students who successfully complete it. “If you want an advantage, you have to live here [in Anchorage] and leave part of your life behind,” said Charatie, who is from the Yup’ik culture and also has Mexican and Samoan roots. Her mother moved here years ago and Charatie knows village life only as a frequent visitor. She said that a choice like the one her mother made is not without consequences. “If you want to advance in the Western world you have to sacrifice your indigenous self, at least in part,” she said. Pickett was a Summer Bridge intern at the U.S. Geological Survey where he spent many days last summer in an office staring at a screen that showed a sort of stop-motion film of one black brant goose nest on the North Slope, home to the Alaska National Wildlife Refuge as well as the majority of the state’s vast oil reserves. Pickett, whose family is from the Siberian Yup’ik, Athabaskan and Iñupiaq cultures, can’t wait to join his advisors on a field excursion to see the geese up close. “It’s almost like torture, looking at pictures of where I want to go,” Pickett said in the days before heading north. Like many ANSEP students, Pickett’s interest in science was sparked by college coursework he completed as a high school student. But what really pulled him in was hands-on experience. First, a professor reached out to him for help with a bird dissection that included removing a sample from the oil glands in the feathers. Then he spent a summer on St. Lawrence Island helping his uncle, who is a paid guide for the University of Alaska, Fairbanks, show scientists around. Pickett was hooked. Now, he is nearly done earning a biology degree (with a minor in math) at the University of Alaska, Anchorage. Friendly, who is from the Yup’ik culture, spent his last collegiate summer in Utqiaġvek, formerly Barrow, the northernmost town in the United States. Friendly found it hard to sleep in the unceasing daylight 773 miles north of his hometown, but he enjoyed his internship researching the nesting habits of Steller’s eider, a rare type of arctic duck that lives here. Riding down a rough road on the edge of the dark Arctic Sea, Friendly said that, after just a short time in Utqiaġvik, he’d learned to identify different types of eider by the shape of a bird’s head or the movement of its wing. He no longer needed to be close enough to see its coloring, he said, which is a help on a rainy day when everything appears in shades of gray except for the stripes of bright blue in the floating sea ice. In the face of assertions that ANSEP students like Friendly are exceptional in a way that most rural Alaska Native students can’t emulate, ANSEP founder Schroeder is adamant that any student who receives the kind of support ANSEP offers can succeed. Schroeder thinks that offering the necessary level of support to every student in Alaska would be possible if students were challenged regularly with hands-on, project-based math and science experiences in every public school. He thinks lectures should be outlawed and peer-led study sessions should be mandatory. While acknowledging the high teacher turnover rate and other challenges faced by Alaskan schools, Schroeder says it’s also time to stop blaming kids’ home lives for their lack of success. Whatever the exact alchemy of teaching model, community building, high expectations and student inspiration, ANSEP makes a difference for the majority of students who participate in it. Sam Larson began his canoe lab looking for loopholes, but he and his fellow ANSEP students may have already found the biggest loophole of all: A program that grants them the opportunity to build on their natural strengths and defy anyone who thinks an old stereotype might define them. 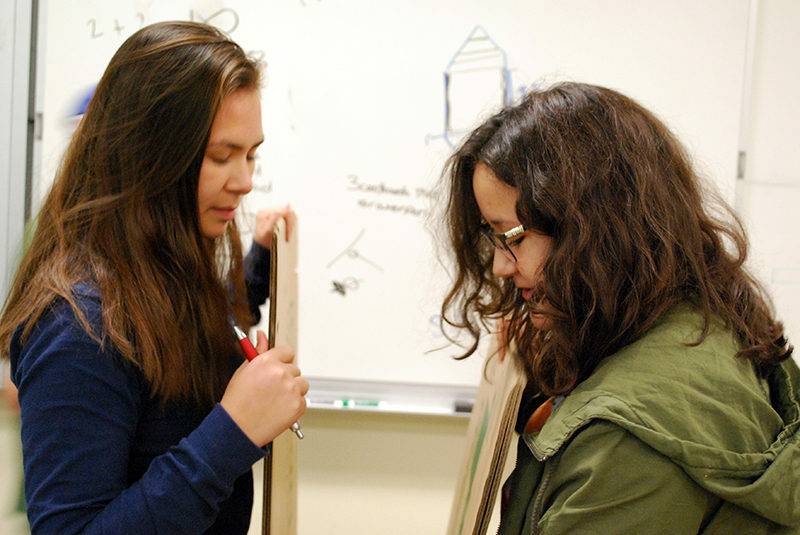 This story about the Alaska Native Science and Engineering Programwas produced by The Hechinger Report, a nonprofit, independent news organization focused on inequality and innovation in education. Sign up for the Hechinger newsletter.